USA | Strike of Lightning! 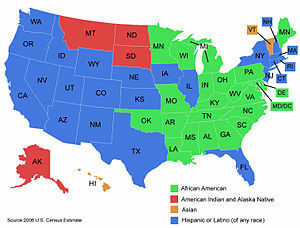 USA; Whites the new Minority! Eight of the largest metropolitan regions in America have seen a decline in the percentage of white inhabitants over the last decade, signaling a majority of minorities in some of the USA’s biggest hubs, including New York and DC. New census data analyzed by the Washington Post reveal that non-Hispanic whites are now a minority in 22 of the 100 biggest urban areas in America. While metropolises such as Los Angeles, San Antonio and San Francisco have seen minority-majorities prior to 2010, now NYC, San Diego, Las Vegas and Memphis have witness the change firsthand, as Black, Asian and Hispanic populations in those areas outnumber that of white residents. The data suggests that the population of whites shrank in only 42 of the 100 cities profiled, but each one of the metro regions saw an overall decline in the percentage of whites per capita. Researchers say that the generally younger crowd of Hispanics and Asians outnumber the percentage of whites still in their childbearing years, and are thus reproducing at a greater rate. Eight percent of adults in America over the age of 65, for example, are non-Hispanic whites. Preliminary data from the 2010 US census revealed earlier this year that the number non-Hispanic white children being born in America had taken a backseat to an increase in minority births in the last decade, and that whites would become the minority by the roughly 2050. In some of the largest cities in America, however, that change has already occurred. While the change is mostly evident in large cities itself, the change is showing up more and more in the outlying suburbs of the metropolitan regions. In metropolitan areas, minorities were responsible for 98 percent of the population growth in the decade leading up to the 2010 census. Workforce aside, demographers note that that the politics associated with minority groups could show a change in control in some formerly white-dominated locales. The Post notes that in Fairfax, Virginia, for example, a moderate Republican community has switched over to a Democratic-minded city. In the Northern Virginia Regional School District, enrollment between 1995 and 2010 rose by nearly 119,000, though only 1,000 of those students were white. 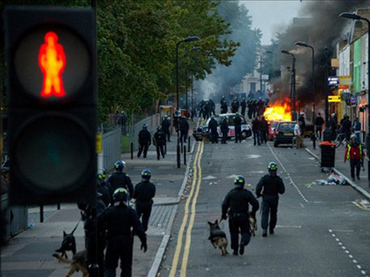 Riots in America, Could Happen! When there is a President such as Obama, anything can happen to the USA. He is hell-bent on its’ destruction, and ultimate bankruptcy. His famous words “YES WE CAN” was never defined as a good thing, and this has become a flagrant rant of smoke. And where there is smoke usually you can find a fire! With civil unrest spreading into the western world, the USis readying what to do should mass riots break out state-side. Is this going to America? What exactly is the official plan of action should the government need to step in and squash demonstrators? Send the military after minorities. “If what happened in London ever happened in the US, the military has plans – CONPLAN 3501 and 3502 – to suppress the insurrection,” writes Ambinder. The instructions contained with the CONPLAN guidelines are believed to be initiatives that the US can enact during times of domestic disturbances. Article I, Section 8 of the US Constitution allows Congress to employ the military if necessary to keep order in America. Explicitly, the legislation states that “Congress shall have power… to provide for calling forth the Militia to execute laws of the Union, suppress Insurrections, and repel Invasion.” Though the lingo contained within the US Constitution is by 200-some-odd years, in today’s terms “militia” would apply to the US Armed Forces. The Atlantic Wire reports that many believe that the CONPLAN initiatives were used with constitutional support in recent years, dating back to the 1992 LA Riots and perhaps as recently as the panic that followed Hurricane Katrina in New Orleans. Nate Jones of the National Security Archive says that the instructions aligned to the CONPLAN initiatives shockingly instruct military personnel that minorities should be monitored to gauge an outbreak of violence. In the documents, “indicators” or rioting includes high unemployment rates among minorities, increased crime rates among minorities, protests arising from income disparities between minorities and majorities and declining rapport between authorities and minorities, among others. United States the Parasite on Global Economy! “Thank god,” Putin said, “that they had enough common sense and responsibility to make a balanced decision.” But Putin, who has often criticized the United States’ foreign exchange policy, noted that Russia holds a large amount of U.S. bonds and treasuries. “If over there (in America) there is a systemic malfunction,this will affect everyone,” Putin told the young Russians. Casually dressed in khaki trousers and a striped white shirt, Putin flew by helicopter to the tented camp as part of a string of appearances that are being closely watched in the run-up to the elections. Youngsters chanted Putin’s name and applauded his remarks as he strolled round the camp, where US-style business seminars, extreme sports and political mudslinging were among the topics on offer. Putin, whose macho image appeals to many Russians, briefly swung himself up the first half of a climbing wall, filmed by a gaggle of state television cameras. Nashi, which means “Our People,” was created by the Kremlin to counter popular dissent after youth activism helped topple a pro-Moscow government in Ukraine’s 2005 Orange revolution. The group has worked to spread a personality cult around Putin and regularly campaigns against Kremlin critics. Opinion polls show Putin, still widely viewed as the country’s paramount leader, retains near 70 percent approval. But his United Russia party is trying to reverse a slide in popularity before December parliamentary polls, hoping to use a strong showing there to help Putin in the March 2012 presidential vote.